A tholin is any member of a family of large, complex organic molecules that form by the action of ultraviolet light on simpler organic molecules. Tholins are thought to be among the chemical precursors to life. Tholins, which are generally reddish brown in color, do not exist naturally on Earth because the present oxidizing atmosphere of our planet blocks their synthesis. However, tholins can be made in the lab by subjecting mixtures of methane, ammonia, and water vapor to simulated lightning discharges. Conditions like this probably exist in many places in the universe, including the icy moons of the outer Solar System. The presence of tholins may help explain the orange-red hue of Titan's atmosphere and the reddish surface of some Centaurs and outer asteroids. In 2008 came the announcement of the discovery of tholins in an extrasolar dust disk surrounding the young star HR 4796A. 1. Waite, Jr., J. H., D. T. Young, T. E. Cravens, A. J. Coates, F. J. Crary, B. Magee, and J. Westlake. 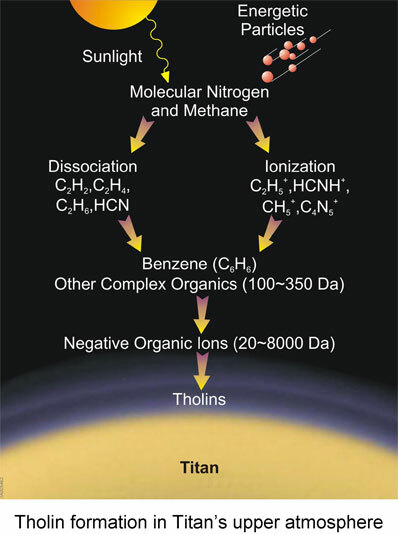 "The Process of Tholin Formation in Titan's Upper Atmosphere." Science, 316, 870-875, 2007.